Most people living in the upper Midwest would argue that this is the most wonderful time of the year, not necessarily Christmas. In Minnesota, we have two groups of people, those who love summer, and those that don’t. In the interests of full disclosure, I fall into the former group. Lucy also leaned more towards loving summer. One could argue that spring could also be the most wonderful time of the year, since like fall, the weather is not too hot or too cold, there are no winged bloodsucking creatures vexing outdoor activities and it is cool enough in the evening for bonfires or cooking outdoors. Fall does have several advantages over spring. Television, cable and streaming service shows start their new seasons in fall; spring was rerun and replacement series season. Football and hockey fans rejoice at the start of a new season while baseball fans are either gearing up for the post-season or muttering “Maybe next year”. The days seem longer during fall though sunrise is a little later and sunset is a little earlier every day after the equinox. Lakes are still warm enough for some late season boating without hitting ice. Many gardens are still in bloom and migratory birds and butterflies begin flocking before undertaking an arduous several thousand mile trek in search of warmer weather. Lucy had one reason she would pick fall over spring for the most wonderful time of the year: fall color. When winter transitions to spring, the color palette changes from white to gray to dirty gray to pale green to green before the flowers start blooming. When summer transitions to fall, the greens and tans are quickly infused with, and then replaced by, brilliant hues of yellow, gold, burgundy, red, orange and shades in between. It is as if summer knows it is going out, so it is going out with a lavishly attired party. Of course, like any large party, the clean up afterwards is time-consuming. Lucy and I had hoped to go on a hot air balloon ride sometime during peak fall color. She was receptive to doing this despite a fear of heights. Perhaps I will do that sometime in her honor. Some areas of the world do not see much color variation between seasons. Large areas of the southwestern United States have two color palettes: green during the rainy season and brown the rest of the year. Areas of the Great Plains are nearly devoid of trees with some wildflowers during the wetter season. Other areas have trees, but the leaves stay on year around because there is little difference between the seasons. 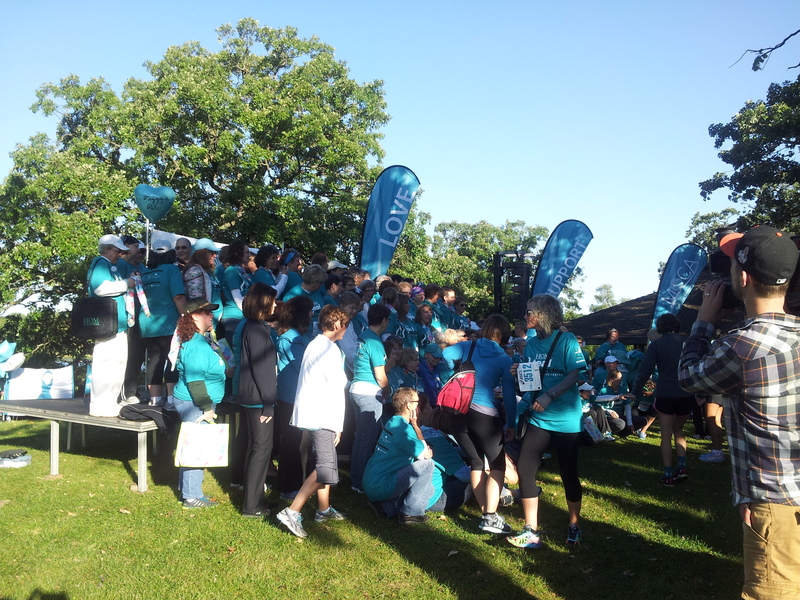 Another fundraising walk benefiting the Minnesota Ovarian Cancer Alliance (MOCA) successfully completed September 6. It is MOCA’s largest fundraising even in terms of money and participants. Last year’s event drew 3,400 participants. This year’s participant count is still unreleased, but it seemed like even more participants than last year. Thank you to everyone who donated, who sent encouragement, and who participated in spirit. The annual Survivor’s Photo was unique this year for two reasons. One of the survivors is seven years old. People think of gynecological cancers as something striking a middle-aged woman, not a pre-teen. It’s a sobering reminder that cancer does not recognize demographics. A nine-year ovarian cancer survivor wore a great costume. She dressed as a cup of mocha with MOCA emblazoned on the cup. The day started out very chilly at 47°F with a breeze off the lake. Standing in a group on over 3,500 people cut down on the windchill. I think the event is getting too large for Rosland Park because it takes almost twenty minutes to get the last walkers on the path after the walk starts, but I understand the appeal of the park. There is a play area for children, and in warmer years, the water park sees action. It is also a dog-friendly park. Thank you again for your support! You help keep Lucy’s memory alive. Labor Day is the final day for the Minnesota State Fair. It has been a Fair to remember for several reasons. Last Saturday’s attendance set an all-time single day attendance record, topping the quarter-million mark for the first time. Unless the weather today turns ugly, the overall attendance for the twelve days will top 1.8 million for the first time. Only two attendance records fell this year, but overall attendance stayed close to record levels. Nearly perfect weather through the Fair obviously helped. I am sure the Minnesota State Fair organization is pleased with their accomplishments and hopes to break more records next year. Lucy and I occasionally attended the Fair. My work schedule frequently impeded Fair plans and neither of us liked crowds. Once we entered the gates, we had a great time and acted like teenagers. Our first stop was grazing through the various food stands and consuming several years’ worth of fried food calories because we knew we would walk it off. Lucy enjoyed the Creative Activities and Fine Arts buildings. She would marvel over the crafting in quilts and cross stitch projects. We would see the photography exhibit, walk through the Department of Natural Resources building and then wonder at how quickly several hours of the day flew past. We walked, talked and joked a lot and probably solved all the world’s problems several times over and managed to get in some people watching. There are numerous small stages throughout the Fairgrounds with free entertainment. The International Bazaar and the Horticulture areas were always must see destinations before ending up on the Midway after dark. Lucy and I tended to be the oldest people on the rides and the ride operators took it upon themselves to try scaring the old fogies. It never worked. We would catch the nightly fireworks show before heading back to the bus taking us back to the park and ride lot. The bus rides were usually more crowded and obnoxious than the Fair lines. Saturday I was invited to attend the Fair with a close friend who also had not attended the Fair in a number of years. Meeting up with someone at the Fair is daunting, but the new transit area is spacious and makes it easy to pick someone out in a crowd. We had purchased tickets in advance, which allowed us to skip the ticketing lines. Of course, the first stop was the food carts to sample the three major junk food groups, “sweet, savory and salty”, items that are not recommended for ingestion by people over the age of thirty. The lemon shake ups probably were healthiest since they were made with unprocessed sugar and counted as a serving of fruit. Roasted corn counted as the vegetable, a corn dog and a pulled pork sandwich are protein, and deep friend cheese curds rounded out dairy. Everything on the very old USDA food pyramid got covered, so it had to be healthy, right? The DNR building was extremely crowded so I did not get a chance to see Robert’s memorial brick. Wildlife Forever sold memorial bricks to help fund renovating the DNR building’s Wildlife Wing. The picture is from the first year the newly renovated Wildlife Wing opened. My friend was a professional photographer for many years and pointed out particular photographer’s works without seeing the information tag. I learned so much about darkroom technique, staging a shot and different print finishes. I always enjoy learning something new and it gave me a greater appreciation for the skill and talent these “shooters” have. People watching, intelligent and witty conversation and Midway ride dares rounded out the evening. The weather stayed perfect through the day and night. I probably will not go on rides pulling 2 Gs again after consuming a jumbo corn dog, deep-fried cheese curds and French fries moments before entering the Midway. Unlike other much younger riders, I could leave under my own power and did not require cleaning up afterwards. Of course my friend promised I would never hear the end of it if I were in a similar predicament. That’s what close friends are for. For those of you observing Labor Day this weekend, I hope you had a fun and relaxing time, surrounded by family or friends, making many great new memories, and laughing until your side are sore. If you are lucky enough to have a special someone nearby, give that person a meaningful hug. You may not have attended a Fair to remember, but you can create a special moment to remember.